Our selection of black diamonds! Black Périgord truffles (Tuber Melanosporum). Use: the perfect ingredient for all your gourmet recipes - fresh pasta, truffled chicken, potatoes cooked in duck fat, black truffle pie, scallops with truffles, etc. – or shaved and sprinkled over any dish to decorate. Suggestion: cut razor-thin slices using a mandoline and place on pieces of buttered fresh toasted bread. Add a drizzle of truffle oil and a pinch of salt and pepper. 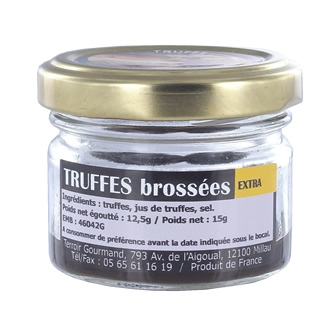 A delightful accompaniment to any dish or served with a truffle aperitif. Ingredients: whole truffles, truffle juice, salt. Shelf life: no need to wait until the last minute, this product will keep for up to 3 years.